The Carriage House, interior design by Workstead, Reclaimed Heart Pine, Vertical Grain flooring by The Hudson Company. Originally from The Hudson Valley, the talented team of designers at Workstead also have a strong presence in the American South—particularly in South Carolina (their work inside Charleston’s Dewberry Hotel is a must see). For a recent residential project in Charleston known as The Carriage House, The Hudson Company had the pleasure of working alongside Workstead co-founders Stefanie and Robert to select and custom mill some Reclaimed Heart Pine, Vertical Grain flooring. 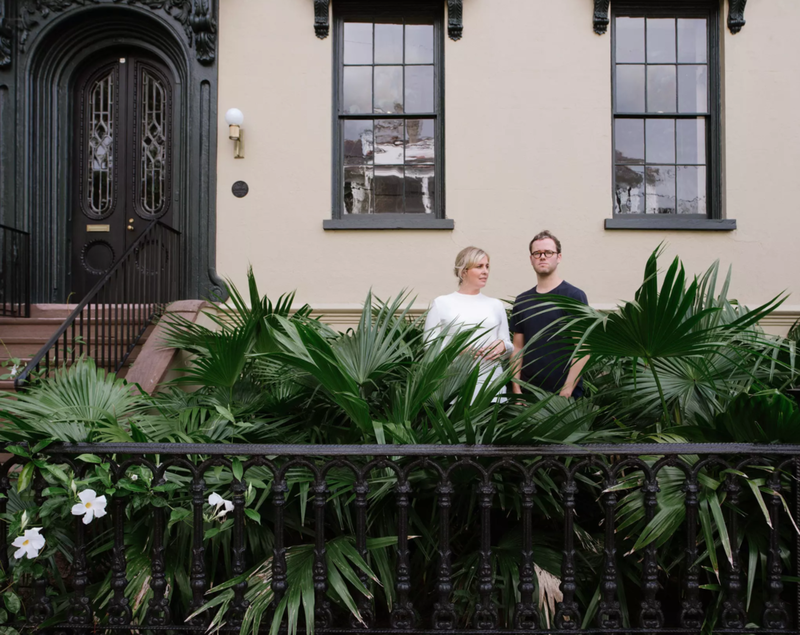 Since the initiation of The Carriage House project, Robert and Stefanie have moved the bulk of Workstead operations back home to New York and we certainly look forward to working together with their team on more projects in the future (including the interiors of their new luxury, multi-unit renovation project in Brooklyn, opening in 2019). 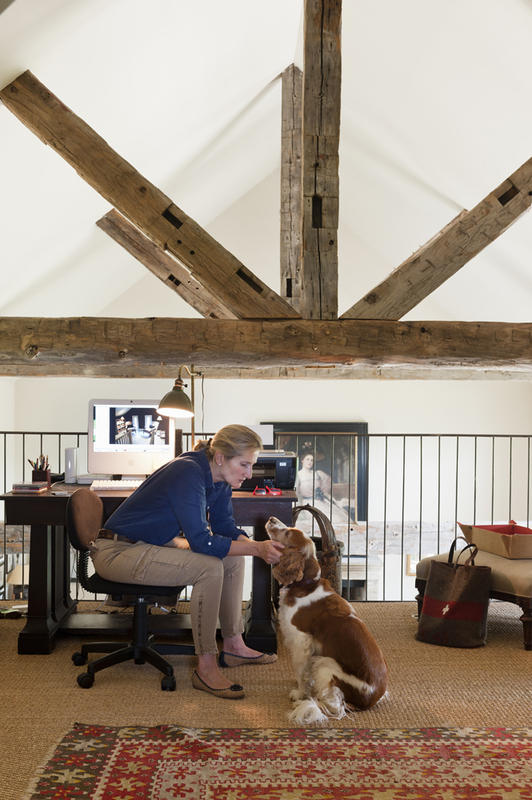 But, until then, enjoy this peek inside the stunning Carriage House project, designed by our friends at Workstead. “The Carriage House contains 2,000 square feet of livable space distributed over two floors, with three bedrooms and three bathrooms. The first floor living room features two gas fireplaces, originally used for cooking and laundering. A brand new kitchen serves as literal and figurative hearth of the home, with cabinetry tucked under the stairs and a grand island providing the counter around which life revolves. A cozy window seat situated within cypress and caned cabinets compliments the dining room along the south-facing facade. The second floor features an anteroom for use as an office or library with an adjoining bathroom. A south-facing bedroom with windows on three sides includes a cypress-clad closet, while the large master suite is complete with two closets, laundry, and master bathroom. A balcony overlooks the brick courtyard below with green hedges for added privacy. See The New York Times Feature Story on Workstead in South Carolina. All Photos below taken from www.workstead.com unless otherwise noted. For the 2017 Collective Design Fair, The Hudson Company was proud to collaborate with designer Brad Ford and FAIR. For FAIR's Collective Design installation, we provided a custom milled floor made from unfinished 2 5/8" Reclaimed Oak, New Face. The flooring material was reclaimed by The Hudson Company from a Pennsylvania dairy barn and re-milled at our Pine Plains, NY mill. About FAIR: In October 2014, Interior Designer Brad Ford organized a modern makers craft fair in upstate New York called Field + Supply. The focus was on modern, elevated craftsmanship showcasing artisans from the Hudson Valley area as well as makers who work in New York City and Brooklyn. FAIR is an extension of that concept and is now a permanent showroom at the New York Design Center. About Collective Design: Collective Design brings together creative voices from around the world in a lively, essential discourse on modern and contemporary design and art. Based in New York City and active in the arts community throughout the year, Collective Design presents engaging conversations and educational programs to foster dialogue, encourage the exchange of ideas, and build a growing audience for collectible design and art. Learn more about Hudson Company Reclaimed Oak, New Face flooring. rag & bone's new men's store at 228 West Broadway in Tribeca. Photo via tribecacitizen.com. This year, The Hudson Company had the privilege to partner once again with the good folks at rag & bone New York to help them curate the interior design of their tenth New York City retail location. For their new 'men's only' store in Tribeca, rag & bone's design team had a specific vision for how to create a luxury shopping experience catered specifically to men - a vision that included custom graffiti in the dressing rooms, an authentic Stormtrooper costume, and a one of a kind Hudson Company parquet floor. Original flooring design concept by The Hudson Company. From the outset of the project, the designers knew that they wanted to create a custom parquet floor with a 'graphic' feel to it. From here, The Hudson Company team suggested a direction for a White Oak flooring design (see sketch at left). The boutique's finished floor was constructed of a combination of straight flooring planks and 24" x 24" parquet panels. The color and finish of the floor was custom selected by the design team to complement the overall interior design of the boutique. As with all of our creative partnerships, it is a pleasure to help innovative brands and their design teams reach their project goals. See our White Oak Herringbone floor for the rag & bone at Bloomingdales location. Visit the rag & bone men's shop and see this unique floor in person: rag & bone Men's Shop is at 228 West Broadway, New York, New York 10013. Phone: 646 277 836. Store Hours: Monday - Saturday: 11am - 8pm, Sunday: 12pm - 6pm. Detail of the store's custom White Oak parquet flooring design. Detail of rag & bone Tribeca flooring installation. All photos courtesy of 1 Hotel Central Park. Photos by Eric Laignel. Sustainability aside, the 1 Hotel Central Park appeals aesthetically: an inadvertent conservatory, a place to dive into nature right in the heart of the city. One of the deeper intentions driving our design ethos is an idea that if you can create empathy or appreciation in things derived from nature, people are more likely to place more value on those objects. So by using natural materials, we hope to affect a change in the way people value nature. Whether it be beetle kill pine in the halls of 1 Hotel South Beach, Reclaimed Redwood from nearby water towers for 1 Hotel Central Park, or living plants in each room, all have been placed there deliberately to engage the senses and bring our guests closer to the natural world. Throughout the development of 1 Hotel Central Park, The Hudson Company worked closely with both the project designers AvroKO and the client to kit out 1 Hotel Central Park with a wide range of high-quality, high-character reclaimed wood flooring, paneling, and beams products, as well as several one-of-a-kind wood installation pieces (see photos above and below). Included at the extraordinary new 1 Hotel Central Park is 50,000 square feet of 8" wide Select Harvest Oak [Silt Finish] flooring, 30,000 square feet of Reclaimed Barn Siding [Grey Board], 50 Reclaimed Hand Hewn Beams, 1,500 square feet of Reclaimed Redwood [NYC Water Tanks], 2,000 feet of Reclaimed Mixed Softwoods [Threshing Floor, Old Face], Reclaimed Travaux Maple [New Face, Chevron] flooring, and a custom finished, debarked Spalted Elm Stump. To learn more about 1 Hotel Central Park, visit their official website. To learn more about how you can elevate your next design project with any of the Reclaimed wood products mentioned or show here, please contact us today. The FAIR exhibit space at Collective Design Fair 2016. The designer behind FAIR is New Yorker Brad Ford. Back in October, 2014, Ford organized a modern makers craft fair in upstate New York called Field + Supply. The focus of that fair was on modern, elevated craftsmanship showcasing artisans from the Hudson Valley area as well as makers who work in New York City and Brooklyn. FAIR is an extension of that concept and is now a permanent showroom at the New York Design Center. It is more edited and elevated than the original event upstate, but the focus remains on high-end, handcrafted design and craft. Many of the same designers who showed their work at Field + Supply are represented at FAIR and several of them are craftspeople that Ford has worked with over the years on his own high-end design projects. Whether he is collecting bespoke furniture, lighting, textiles, or ceramic objects for the FAIR showroom, Ford's has established an aesthetic that fits well with The Hudson Company's own design values. So, we were proud to collaborate with Brad for this year's Collective Design Fair in NYC. As a part of FAIR's exhibit space at CDF, Ford incorporated Hudson Company Select Harvest White Oak [French Cut, Bare Finish] flooring, as a contrast to the glossy white concrete of the event space flooring.The end result was an exhibit space that felt warm, clean, welcoming, and modern - all adjectives that clearly describe what FAIR is all about. Click here to learn more about Hudson Company Select Harvest White Oak [French Cut, Bare Finish] or contact us for a quote for your next design project. Hudson Company Select Harvest White Oak [French Cut, Bare Finish] floors used by designer Brad Ford at Collective Design Fair 2016. Interior design by Brad Ford. 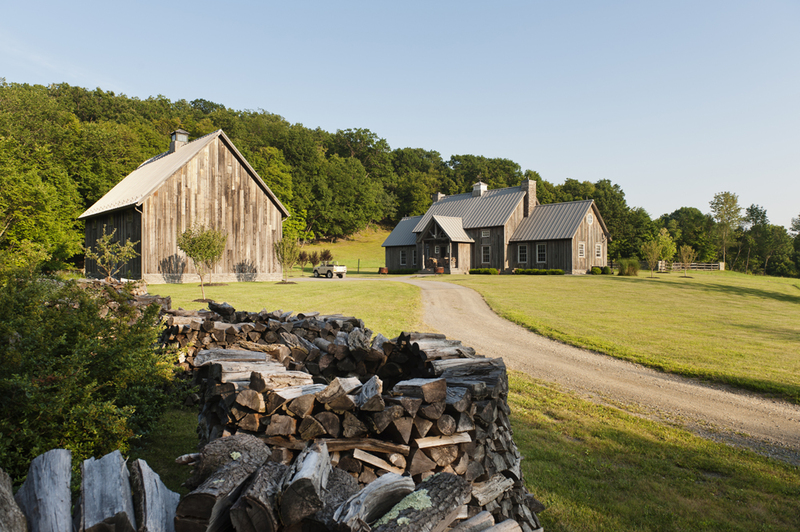 When designer Ken Holzberg was ready to build his dream home at Stonewood Farm, near Millbrook, New York, the goal of his project was to create something new, while still retaining a sense of continuity with the past. Upon visiting The Hudson Company Mill, Ken was able to find flooring materials, exposed beams, and antique lumber that fit his precise vision. Choosing to incorporate 1,000 square feet of Reclaimed Hemlock floors, Reclaimed Softwood Beams [Original Face]. and an additional 3,000 square feet of Reclaimed Mixed Softwood [Threshing Floor] flooring - both sourced from historic farm buildings in the area - Ken was able to achieve the desired effect of a modern, informal home that is rich in historical character. This installation profile originally appeared in The Hudson Company Journal, Volume 1. To request a print copy of The Hudson Company Journal, please contact us at info@thehudsonco.com. This 4,000 square foot West 29th Street Loft, designed by the talented team at Studio DB was completed in the summer of 2013 and features Hudson Company Select Harvest White Oak [Cascade Finish] flooring. Because the client in this project was a family with four kids, the architects incorporated a lot of creative and durable elements into their design solutions - not least of which was their choice to use The Hudson Company's pre-finished Select Harvest White Oak flooring. On their website, Studio DB outlines the the design program for the loft's design: "The kitchen anchors a large, open living and dining room with window exposures on three sides. Access to the kids' bedrooms is off a custom wallpapered hallway with a zip-line down the middle. The kids' rooms each connect to a shared loft space, with unique access from each bedroom including a colorful rock wall, monkey bars, and a concealed ladder. The interconnected loft ends at a slide which filters down into a corner playroom. The master suite is a more sophisticated space. A light filled study is tucked behind the master bedroom, which is separated by steel and glass doors." To learn how The Hudson Company can help you reach your goals for your next design project, contact us today at info@thehudsonco.com. Photos by Mike Garten for Studio DB, Copyright of Studio DB.